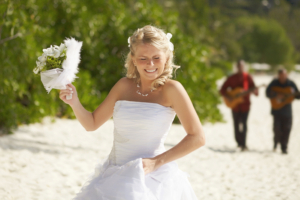 Gorgerous bride walking to wedding ceremony on the beach with bouquet. Beautiful hawaii wedding. Tropical carribean wedding moments. Don’t you just love technology? “I DO”. I guess I get a little frustrated when people complain about social media,texting, skype, or any other type of instant messaging. The reason I love it is that it gives me and my clients,(who are very busy) and opportunity to communicate and keep in touch, even though our schedules may limit our actual face to face time. In a perfect world we would meet every time and get things done. But reality dictates that we now can “Google Talk” or “Skype” without leaving the comfort of home or office. Besides, who wants to get on the freeway and deal with the frustration of time constraints, traffic, and not to mention the cost of gas. As I said in an earlier blog, I am an old school person who says “let’s meet, hang out and talk about your wedding or event….but I am finding it easier to adapt to the “on-line face to face”. Also, I think for my potential clients, it gives them an opportunity to actually meet their potential DJ’s, without investing time and travel. Last year, I Skyped about twice with potential clients and meetings to finalize wedding details. So far this year, I have Skyped and Google Talked with clients about ten times. In one case, we did everything from our initial meeting, to the event planning and final meeting through the internet. When we finally met on their wedding day, it was like meeting an old friend that I haven’t seen in a while. So…..don’t be afraid to jump online and check Sound Garden Productions out. By the way, when I’m at my home office, I know I have a business shirt on, but what you can’t see are my pajama bottoms!!! As always, Happy Planning and Let’s Do This!! !